Potential pollutant sources can come in many forms from leaking backhoes and trucks to non-storm water discharges, such as wastewater leaks. However, many potential pollutant sources are the everyday activities that drive the money-making activities on a site, such as excavation on a construction site or metal fabrication on an industrial site. Not all production activities cause storm water pollution, but the focus of the inspection is on where the pollutants can escape the BMPs and cause storm water issues. It can be tough for production workers to hear that their work is potentially causing a storm water problem, because “it’s just dirt” or “everyone does it.” This is where the inspection process really should have started before an inspector ever arrived—back when storm water awareness training was done. And, please don’t tell me you have never done storm water awareness training. Storm water awareness training, which involves the entire staff or team at a site, not just the storm water team, is a key part of setting the stage for inspections. In the training or outreach (municipal permits), the reasons and rationale behind the storm water permit and regulations need to be established. For example, in our online training platforms and in-person workshops, we start the sessions explaining how storm water (usually untreated) is different than wastewater (treated). The next step is explaining the negative impacts that storm water pollutants can have on the waters the attendees all enjoy when they fish and hunt. A good question to ask is, “Who hunts or fishes or swims?” This sets the stage for explaining that storm water permits, whether they are municipal, construction or industrial, should be followed to protect the environment, meet legal requirements and minimize financial impacts. It is the last point, financial impacts, that I usually focus on, because money talks (or maybe it is people listen). If the entire staff or team is lazy, unaware, or irresponsible with BMPs, etc., it will cost the environmental team a lot more time and money to meet the permits, which is their job. Furthermore, the risk of citizen lawsuits and regulatory action is very real and very, very expensive. When I explain to a group of industrial workers that not sweeping and replacing storm drain inserts could result in a million-dollar lawsuit, they usually pay attention. This is because we are all human and a million dollars matters to most of us, except maybe Bill Gates, and no one wants to be the one that causes their company to close due to storm water issues. Now that I have their and your attention, we can all dig into what BMPs we should be doing and the potential pollutants we should care about on our site. Training and outreach is the start of the conversation, but a key piece to set the stage for when an inspection identifies a deficiency everyone knows what to do next. The identification of a deficiency is not the inspector’s only responsibility. It must be communicated out to the person responsible for fixing it (assignment) and the steps they need to take to fix it (corrective action). In addition, in some cases an expected date of completion and the date it was fixed (corrective action date) needs to be included. 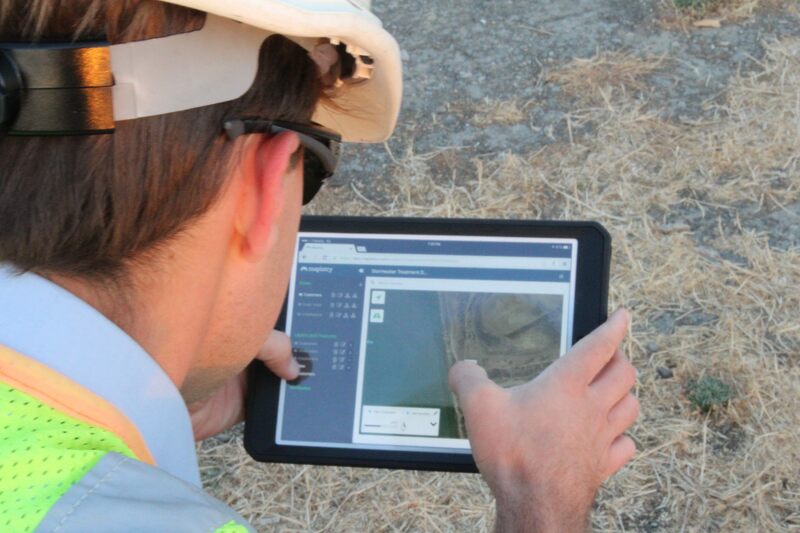 Across the industry, we are seeing this process automated more and more through mobile technology as nearly every inspector carries a smart phone or tablet. The benefit of this is that communication happens instantly, when an inspection is completed, which reduces potential problems for storm water discharges. By automating the process, an inspection report can be generated for permit compliance (e.g. five-year record retention requirement) and available centrally for an entire team, whether it is a contractor and developer (construction permit) or public works employees and environmental inspectors (municipal permit) or a facility manager and environmental, health, and safety (EHS) specialist (industrial permit). This communication of problems is a key piece of active storm water permit compliance and one that often falls short. Too often we see an inspection done, then the piece of paper filed away in a three-ring binder in a work trailer or office. Maybe a phone call is made to the maintenance crew to replace a storm drain insert, but that takes more time and frequently is not done until days later, if ever. The keys of a good storm water inspection, regardless of the type of storm water permit, starts with engaging, interactive training and continues with a diligent inspector, who can spot potential problems, and is capped with quick communication of deficiencies and corrective actions. Oh, and the key in all of this is implementing the corrective actions and fixing the problem. For more on how municipal storm water programs can more effectively inspect construction sites, post-construction BMPs and commercial/industrial sites, I am going to be teaming up with Storm Water Solutions on June 6 for a free webinar to discuss the technical aspects of inspections, including identifying, reducing, and eliminating illicit discharges, and identifying problematic or missing BMPs on construction and industrial sites. I hope to see you online ready to fire away with your best questions—and critiques.